While some councils are apparently keen to have additional powers to catch drivers who stop in yellow box junctions, new RAC research suggests 80% of motorists struggle to get through them without stopping. In the RAC survey, published on 22 November, 67% of respondents had difficulty getting through ‘some’ yellow boxes without stopping, while 13% said this is the case for ‘most’ of the junctions they encounter. 78% of those who experienced difficulty said the problem is very often caused by poor sequencing of traffic lights. 32% blame their infringement on the fact so many other drivers break the rules that it forces them to do the same. However, 13% of respondents said every yellow box junction is ‘easy to negotiate’ without coming to a halt. Currently, only local authorities in London and Cardiff are able to enforce yellow box junctions with cameras, and issue penalty charge notices (PCNs). However, according to the RAC, many more councils in England and Wales would like to use cameras to enforce these often ‘troublesome and controversial’ junctions. The RAC says declining number of roads policing officers means there is currently little or no enforcement of the offence in other areas – leading to calls for a roll-out of camera enforcement. 36% of respondents to the RAC survey believe councils should be able to issue PCNs – while an additional 36% agreed they ought to have the power, but should limit enforcement only to problem junctions. 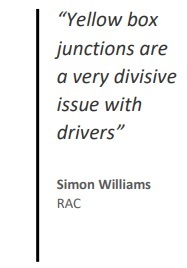 Simon Williams, RAC spokesperson, said: “Our research shows yellow box junctions are a very divisive issue with drivers. “While the majority are in favour of councils more widely being allowed to use cameras to catch offenders, there is a strong feeling that many junctions are not set up fairly which leads to drivers having no choice but stop in them, whether that’s due to poor traffic light sequencing, poor design or being used in the wrong place. “The RAC is generally supportive of local authorities having the power to enforce yellow box junctions because of the value of local knowledge, but has concerns that it could lead to local authorities being inconsistent in their application of road traffic law. “There is also a risk that cash-strapped authorities may see it as a lucrative revenue stream. To prevent this, we think warning letters for a first contravention would be appropriate. 1. Many yellow boxes are old and therefore well worn and sometimes difficult to see so drivers don’t see them especially in the wet. That being said many drivers use the same roads and therefore would be aware of their locations. local drivers should know better and deserve all that they get. 2. Too many driver actually speed up when approaching green lights even though they can expect them to change at any time, obviously not worried about shooting a red light but more concerned with stopping at one. Certainly never stopping at an Amber one!!! That’s a definite NO NO.. This usually leads to vehicles getting faster and closer together so that when they are unfortunately forced to stop they have taken no notice of the yellow boxes and end up in them. A well deserved summons I think. 3. Tailgating, by being so close to the vehicle in front and following on like sheep they do not give enough safe distance to actually look and see that there is a box junction ahead . When the do, due to the close proximity to the vehicle in front it’s too late They deserve to get done. All in all they need some discipline and thoughtfulness, education and enforcement then they may respect the law which is there not for their own safety and the safety of others. So it’s the ‘other’ drivers and the traffic signals causing these offences to happen then. There used to be far more road safety ads on TV than there are now and one I remember was about the yellow box junction. The older ads seem to stick in the memory longer and the message was and still is clear – you don’t enter the yellow box unless your exit is clear, unless turning right. As far as I know, that is still the rule. Authorities would do well to learn from previous unpopular technology introductions and make the new yellow box junction cameras fire proof. When some new speed/safety cameras came in a few years ago there were some that were considered ‘very unfair’ and so enraged some people that the cameras were burnt out – repeatedly in some locations. Cameras don’t come cheap and the capital replacement costs may cancel out the expected “lucrative revenue stream”.